Forget the Slomin Shield - if you really want home security, move into the Safe House. We're not talking about a few bars on some windows or heavy duty locks here. 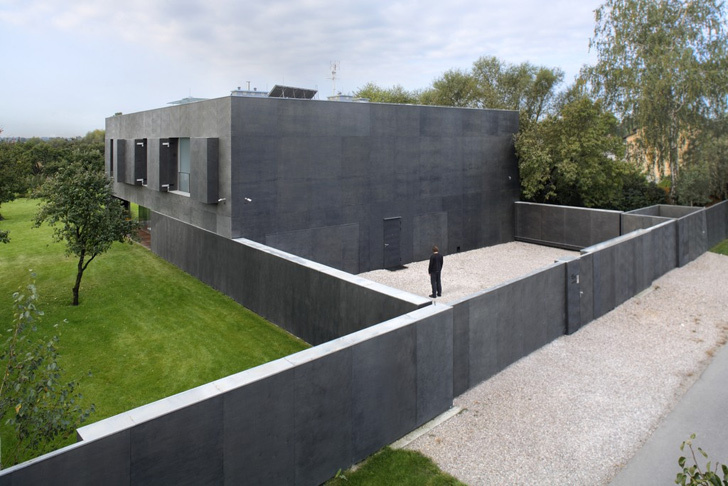 The <a href="http://knstrct.com/2011/04/10/the-safe-house/">Safe House</a> is a minimalistic home that transforms into an impenetrable concrete cube at the push of a button. Designed by Polish firm <a href="http://www.kwkpromes.pl/">KWK Promes</a>, the modern day fortress also features a hybrid heat system (with most of the energy harvested from from renewable sources) as well as passive house strategies. The photo you're looking at right now shows the home in its "secure" state, click through the gallery to see how it looks when it transforms. 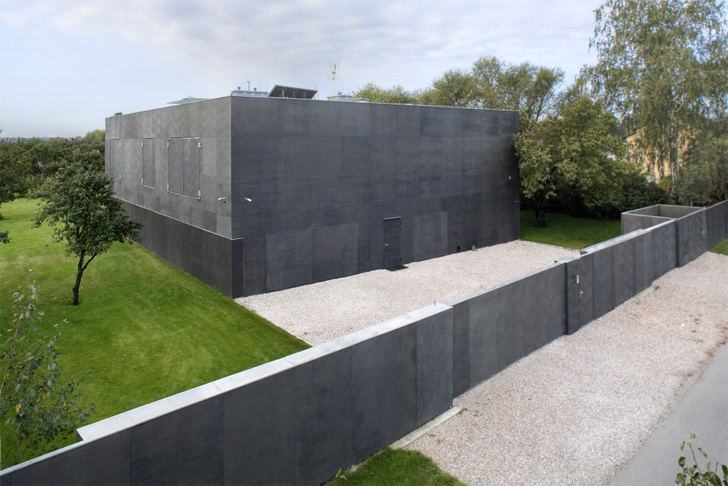 Located in a small village on the outskirts of Warsaw, the Safe House is surrounded by a series of thick, movable walls that arm and disarm like an armadillo's armor. In its daytime state, the eastern and western side walls move apart to the <a href="https://inhabitat.com/gardening">garden</a>. Even in this configuration, the outer walls remain securely shut so that there is no risk of children running into the street while playing in the front yard. When visitors approach the outer gates, they can be admitted, but the side walls come forward to create a buffer zone while the person's identity is verified. The walls aren't the only parts of the home that move. 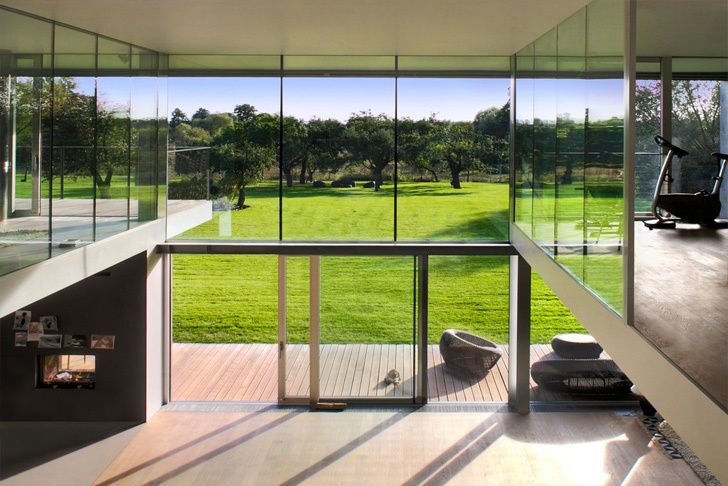 Large shutters create an extra layer of protection over the windows and a drawbridge (talk about going medieval) leads to a <a href="https://inhabitat.com/the-meera-house-has-a-curvaceous-meadow-of-green-for-its-roof/">roof terrace</a> above the swimming pool. The southern elevation is secured via an <a href="https://inhabitat.com/solar-hangar-recharges-zero-emission-electric-airplane/">airplane hangar</a> style roll-down gate made by a company that normally supplies shipyards. An added plus to the southern facade is that it doubles as a gigantic movie projection screen. The house was built with security in mind but sustainability played a large part too. 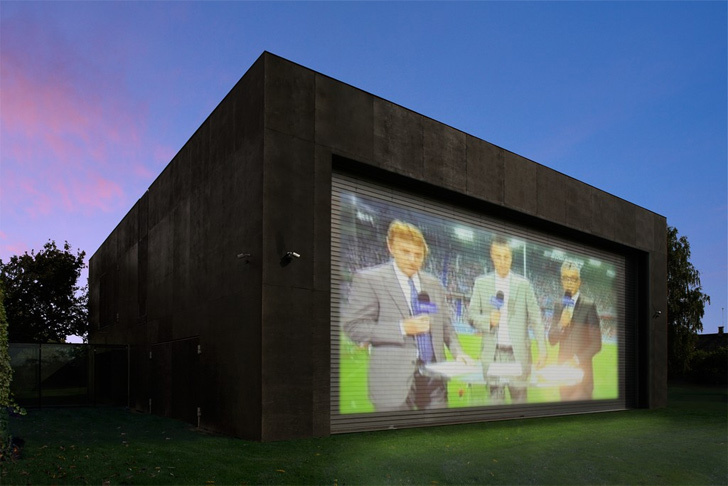 "Wide glazings behind the movable walls let the building acquire <a href="https://inhabitat.com/energy">energy</a> during the day (winter) or prevent the sun's heat from going into the house (summer)," explains KWK Promes. "At night, when the house is closed, the thick outer layer helps the building to accumulate the gained energy. 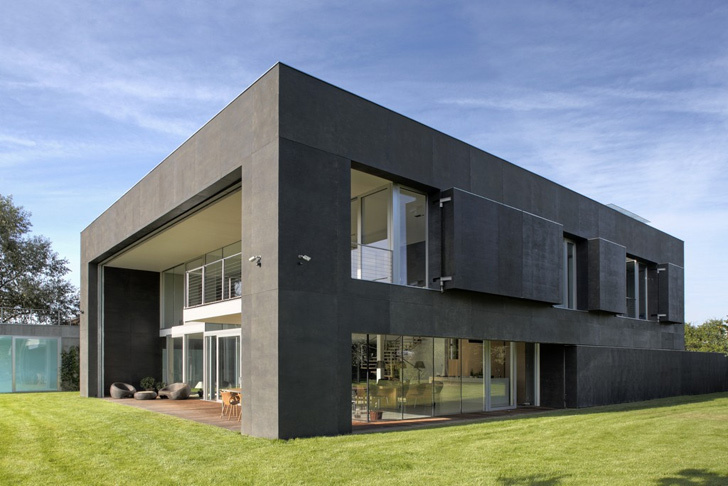 Such a solution together with the hybrid heat system (most of the energy is gained from renewable sources – a heat pump and solar systems supported with gas heating) and mechanical ventilation with heat recovery makes the house become an intelligent <a href="https://inhabitat.com/stunning-fablab-passive-house-unveiled-at-europes-solar-decathlon/">passive building</a>." Forget the Slomin Shield - if you really want home security, move into the Safe House. We're not talking about a few bars on some windows or heavy duty locks here. 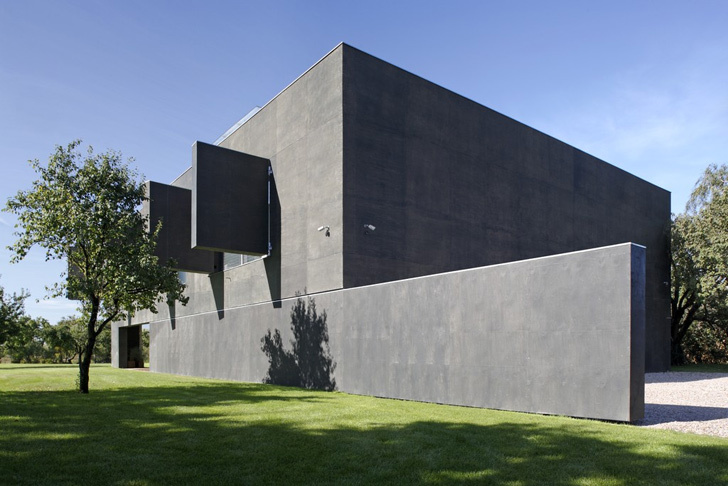 The Safe House is a minimalistic home that transforms into an impenetrable concrete cube at the push of a button. Designed by Polish firm KWK Promes, the modern day fortress also features a hybrid heat system (with most of the energy harvested from from renewable sources) as well as passive house strategies. The photo you're looking at right now shows the home in its "secure" state, click through the gallery to see how it looks when it transforms.